In this issue we look at some medieval roads in Perthshire, a road over Rannoch Moor that was never constructed, Wade's High Bridge, and what the "rode" of Gartanrode might be. 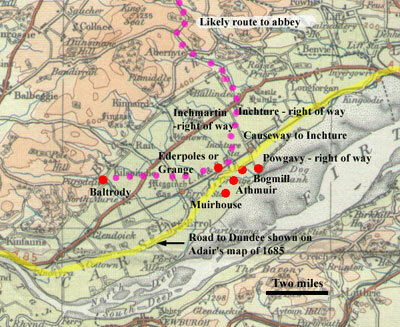 This looks at roads mentioned in charters of the abbeys of Coupar-Angus, Inchaffray and Scone. A fair number of the roads mentioned were little more than local tracks to outlying farms even though in later times they may have been replaced by a proper road. Others, however, are quite interesting and in a couple of cases pose quite difficult problems. One of these for Coupar talks of 3 roads passing through the parish of Cargill, one of which is probably the "Abbey Road" of the OS maps and which at some point on its course seems to have become conflated with the Roman road hereabouts. There are also difficulties with a "bridge over the Isla" as to what link it might have had with an earlier Roman bridge over this river. Coupar-Angus lands in the Carse of Gowrie. The road shown on Adair's map may be the same as one mentioned in charters of 1492, indicating an early route between Perth and Dundee. Based on quarter-inch OS map of 1923, with thanks to Ordnance Survey. Coupar received generous grants in Glenisla to the north and a network of routes developed to service the farms. 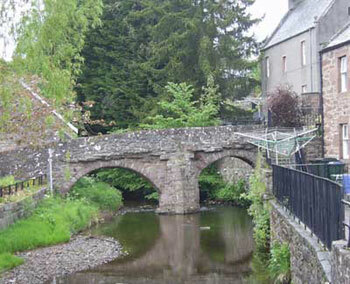 The main route went through Alyth where there is an interesting packhorse bridge. To the south they had lands in the Carse of Gowrie which, with customary skill, they drained and made productive. In one place they made a causeway across marshy ground. Several ferries and fords are mentioned; one at Coupar required the boat man to be “suet and gentill, and mak gud seruice to al that cummys without strublans.” One ford at Bendochy was 3 feet deep and another at the Bridge of Couttie, just north of Coupar-Angus, had two stones - a "wading stane" and a "riding stane" - it looks deep and dangerous today. Inchaffray abbey was on an island site near to the very marshy Pow. Although it can no longer be seen today, a causeway ran across this marsh and continued as a track towards Fowlis. North of Fowlis a track ran to Buchanty. Pack-horse bridge in Alyth. As it is on a direct route to Coupar-Angus lands in Glenisla, it may have been built by the abbey. There is a similar bridge at Brunty south-west of the abbey. to use if they either constructed or repaired it (it is not clear which). The Scone charters do not make much mention of roads although they did have lands over quite an area to which they would need access. Of particular interest is one for the Tibbermore area where a paved road (strata) is mentioned as being beside a well called the King's Well. This allows us to identify it as the Old Gallows Road which in later times ran to Crieff. The fact that it was paved makes one wonder if it was the continuation of the Roman road that ran along the Gask ridge. Another Scone item of interest is a request from Robert the Bruce to take stone from their quarries near Scone to use on the bridges of Perth and of Earn. In his 5th Report (1811) to the Commissioners for Highland Roads and Bridges, Thomas Telford put forward proposals for a road across Rannoch Moor. It was intended to shorten the route that drovers took from the west coast and Skye to the markets in the south of Scotland and avoid the delays of the ferry crossing at Ballachulish and the difficult route through Glencoe. Although the route was worked out in some detail, it never got off the ground, mainly due to the lack of interest from landowners. 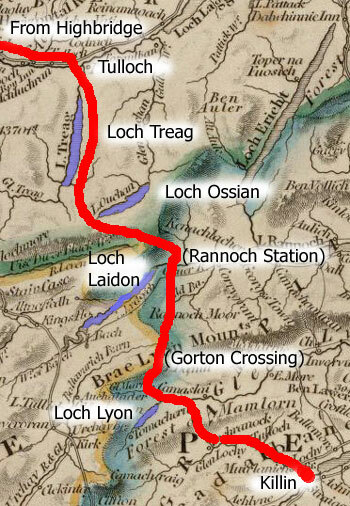 Telford's proposed route over Rannoch Moor. Based on map of Scotland by J.Arrowsmith, 1844, courtesy of David Rumsey Historical Map Collection. The image is copyright Cartography Associates but has been made available under a Creative Commons license for non-commercial use. was then to follow the route later adopted by the West Highland Line past Loch Ossian and the east end of Loch Laidon down to near the county boundary and Gorton Crossing where an old track led over a pass to Glenlyon. It was to continue to the end of the now much enlarged Loch Lyon at Pubill then head south over the Lairig nan Lunn pass (a modern road goes part of the way) into Glen Lochay and so to Killin. between Fort William and Inverness. It saw the first action of the "Forty-Five" when government reinforcements were prevented from crossing it. 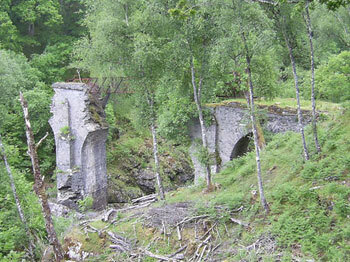 It was replaced by Telford's Spean Bridge in 1819. 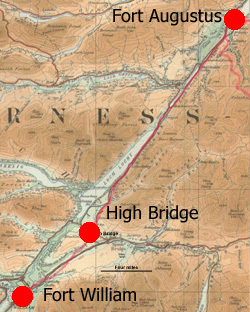 Map showing High Bridge on Wade's Fort William to Fort Augustus road. Based on 1/4 inch OS map of 1923. With thanks to Ordnance Survey. The bridge is easily reached by footpath from the Commando Memorial just north of Speanbridge which accesses a viewing point. A metal walkway was installed in 1894 due to the dangerous condition of the bridge, but is no longer safe to use and is to be removed. This appears in the Itinerary of Edward I in 1303 when he was staying at Lochindorb. It is usually identified as being near the Boat of Gartan. The name is interesting as it suggests a road. However, Louise Yeoman in the Boat of Garten community newsletter BOG Standard, Winter 2012 (page 18) suggests that it may have been a fortified site near Boat of Garten called Petriny Motte (on Mains of Garten farm); effectively, the rath of Gartan, where "rath" means a fort. This was a Comyn stronghold and would give a good reason for Edward to come here. Despite the "rode" probably not being a road there does seem to have been a road in this area - this was the Rathad na righ or king's road as mentioned by the Rev. W. Forsyth in his In the Shadows of Cairngorm (chapter XXV, page 205) and which may have been linked to a king's highway at Inverallan to the north. The atlas is now online at the ScotlandsPlaces website. Illustrated with maps and explanatory text, it covers all historical periods up to 1707. A number of the topics are very relevant to roads. Roman roads are covered over several pages showing the network in different periods. Pictish, Cumbric, Gaelic, Anglian and Viking placenames give an indication of where early routeways might have been as do the royal itineraries included in the atlas, as well as invasion routes. Numerous other pages, such as those for trade, also suggest routes. The atlas has been produced by the Scottish Medievalists and the Department of Geography of the University of Edinburgh.